If modern French poetry began with Rimbaud’s observation that ‘je est un autre,’ Francis Combes believes that poets should now say, ‘je suis tous les autres’. The author of fifteen books of poetry, including La Fabrique dubonheur, Cause commune and La Clef du monde est dans l’entrée à gauche, Combes has also published two novels and, with his wife Patricia Latour, Conversation avec Henri Lefebvre and Le français en liberté – Frenglish ou diversité. He has translated several poets into French, including Heine, Brecht, Mayakovsky and Joszef. ]He runs the radical publishing cooperative, Le Temps des Cerises, directs the poetry biennale in Val de Marne and was for many years responsible for putting poems on the Paris Metro. ‘Poetry,’ argues Combes, ‘does not belong to a small group of specialists. It arises from the everyday use of language. It is a way of keeping your feet on the ground without losing sight of the stars. It is at the same time the world’s conscience and its best dreams; it’s an intimate language and a public necessity.’ Drawing on the tradition of Hugo and Aragon, the idea of une poésie d’utilité publique runs through Francis Combes stunning new collection, frompoèmes sans domicile fixe to poèmes moraux et politiques. 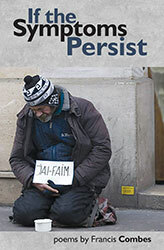 It is a book about poverty, homelessness, inequality, racism and the endless wars of the twenty-first century. It’s a book of gentle humour and savage irony. It is that rare thing, a collection of poetry that is both useful and necessary. ils ne lui pretent aucune attention. they pay him no attention. au chaud, dans les gaz d’échappement. warm, in the exhaust fumes. neuf heures trente, un lundi matin. half past nine on a Monday morning. seule dépassait de l’emballage doré. que la ville se serait offerte. stuck out of the golden package. the city had given itself. les travaux forcés du libre marché. puis abandonnée sur un vieux matelas. the street of la Cloture. the forced work of the free market. then abandoned on an old mattress. Francis Combes’ books of poetry include La Fabrique du bonheur, Cause commune and La Clef du monde est dans l’entrée à gauche. 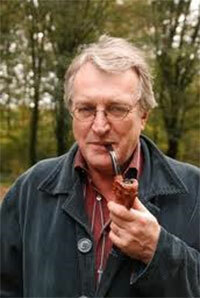 He has also published two novels and, with his wife Patricia Latour, Conversation avec Henri Lefebvre. He is a founder of the radical publishing cooperative, Le Temps des Cerises, and was for many years responsible for putting poems on the Paris Metro. Alan Dent is a poet, translator, critic and editor of the radical cultural journal Mistress Quickly's Bed. His translations includeWhen the Metro is Free, Poets and the Algerian War and Common Cause, all published by Smokestack.